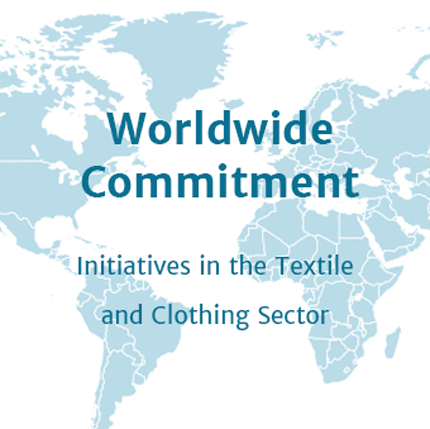 The Partnership for Sustainable Textiles adheres to the principle of binding procedural obligations: all members are committed to achieving concrete goals, as laid out in the so-called review process. They will prosecute these goals verifiably and work towards making them ever more ambitious. The individual targets of our members are oriented to key questions and indicators which have been devised by the Working Groups. These implementation plans – called roadmaps – were handed in for the first time in 2017 and are going to demonstrate individual progress every year. 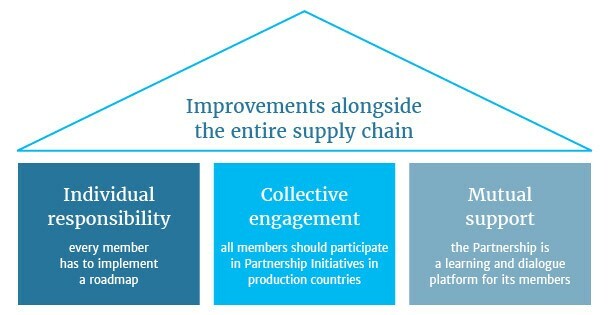 Partnership Initiatives are measures in textile producing countries which are jointly devised, carried and implemented by a number of members of the Textiles Partnership. They are supposed to improve the basic conditions on the ground, integrate suppliers and local actors, and create Best Practices in the process. In the Textiles Partnership members learn jointly and from each other. On the members’ platform and in the Working Groups expert colleagues can exchange information and discuss content-related questions – if necessary, even with external expert support. Partnership members also benefit from varying training opportunities, for example, webinars on “Living Wages”, workshops on “Water Management” or a summer school on the topic of “Sustainable Chemistry”. The daily work of the members is supported by the Partnership Secretariat with practical assistance and instruments such as calculation tools for the determination of the cotton content or a compilation of indices of risk countries.